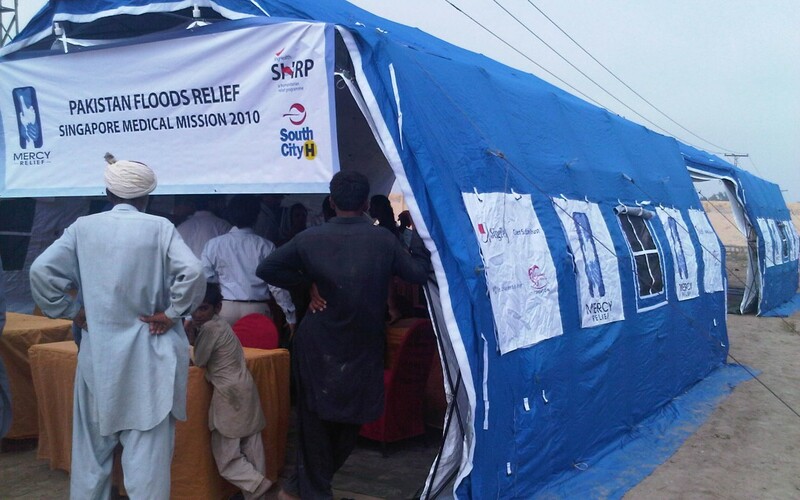 Mercy Relief and the SingHealth Humanitarian Relief Programme (SHRP) set up the Singapore field medical center at an IDP camp in Sukkur, Pakistan, yesterday and treated more than 400 patients over the last two days. Half the number of patients comprise children. The medical cases were mainly gastro intestinal,upper respiratory track infection (URTI) and skin disease. The Singapore team is partnering the local Pakistani South City Hospital and are serving the IDP camp which holds about 1,000 families (averaging 7 members per family). The team is expected to be in Sukkur for 2 weeks before being relieved by a second team which will continue the medical relief services until end of October. Mercy Relief had earlier distributed food, tents and clean water worth SGD600,000 immediately after the floods occurred in late July. These were donations from Singaporeans and the Singapore Government. Mercy Relief is a Singaporean humanitarian organisation which engages in both disaster relief and sustainable development programmes. It was established in 2003 as an independent non-governmental humanitarian charity responding to the human tragedies in Asia. Mercy Relief’s aid programme focuses on providing timely and effective assistance to disaster-stricken communities and has maintained the delivery of emergency aid within 72 hours from the point of appeal for assistance. In the past 12 years, Mercy Relief has disbursed over S$32 million in aid across 40 disaster relief and 53 sustainable development initiatives. Mercy Relief has impacted an aggregate of 2 million lives in 24 countries and areas, namely Afghanistan, Bangladesh, Cambodia, China, DPR Korea, India, Indonesia, Iran, Iraq, Japan, Laos, Lebanon, Malaysia, the Maldives, Myanmar, Nepal, Pakistan, Palestine, the Philippines, Sri Lanka, Taiwan, Thailand, Vietnam and Yemen.